Twilight and Cupcakes? Why not? So I’m sure you – and the rest of the world – are aware that the new Twilight movie, Breaking Dawn Part 1, opened a little over a week ago. Well, the Cupcake Crusaders couldn’t miss out. We admit it, we are fans. 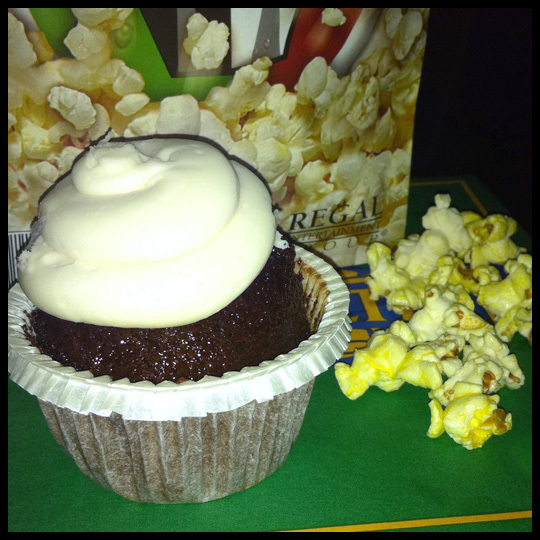 Sweet decadent cupcakes combined with deliciously buttery and salty popcorn is an amazing combination. And this Hot Chocolate cupcake was fantastic. The chocolate cake was dense, moist and rich. It actually tasted like hot chocolate. The marshmallow buttercream was sugar, gooey and a wonderful addition. The movie was pretty good too. Probably the best of the 4, in my opinion. Not the best movie I’ve ever seen, but for some reason, that doesn’t stop me from rushing to the theater every time one is released. UPDATE: We are sad to say that Caroline’s Cupcakery is now closed after serving Baltimore for 2 years. This entry was posted in Baltimore, Cupcakes and tagged Breaking Dawn, Caroline's Cupcakery, Cupcake, hot chocolate, Movie, Twilight by Stacy. Bookmark the permalink.